When the snow comes, it’s important to be prepared with the best cordless snow blower to keep your outdoor spaces clear and accessible. Although they’re not as powerful as gasoline-powered alternatives, cordless snow blowers are an environmentally-friendly choice that is great if you’re dealing with smaller spaces, like driveways, patios, or backyard areas. Before we begin, if you’d like more ideas on how to combat the winters, check out our Patio Heaters and In-Ground Fire Pit Ideas articles. This lightweight cordless snow blower is a great choice for clearing the snow out of your outdoor living spaces, weighing in at 32 pounds. It comes with a 40 volt 4.0 Ah EcoSharp rechargeable lithium-ion battery and a charger. On a full charge, you can get up to 50 minutes of quiet run time. The steel auger has two rubber blades which can move up to 495 pounds of snow per minute and cut an 18-inch path of up to eight inches of snow without damaging the surface of the pavement. The auto-rotate directional shoot can move 180 degrees and throws snow up to 20 feet. It also features an instant start button with a safety switch and a 3 watt LED light. This snow blower is designed to handle a moderate amount of snow and works best with dry snow, rather than heavy, wet snow. The Greenworks PRO cordless snow thrower is another useful option. It offers slightly more depth than the Snow Joe above, cutting a 20-inch path in up to 10-inches of snow. It weighs 33 pounds and has up to 45 minutes of run time on a full charge of the 2.0 Ah battery. It has a stress-free push-button ignition and features a brush motor that will last for a long time and requires minimal maintenance. The 80-volt lithium-ion battery provides you with unwavering power and comes with a built-in battery life indicator. The battery comes with a quick charger that’ll give you a solid charge in only thirty minutes. This snow thrower has a 180-degree adjustable throwing chute with an easy to use handle, dual LED lights, and can discharge snow up to 20 feet away to make sure your whole outdoor living area is easily cleared. It also comes with a four-year warranty against defects and a two-year warranty on the batteries and charger. This heavy-duty snow blower is one of the only cordless two-stage blowers on the market. It can clear up to 1000 pounds of snow per minute, which makes it easily the strongest cordless blower on this list. This machine comes with two 40-volt 6.0 Ah lithium-ion batteries which provide up to 20 minutes of remarkably quiet run time. One common complaint is that the batteries tend to take a while to charge, so you’ll need to prepare ahead of time if you know that winter is coming. It also features an easy push-button start with an integrated, illuminated LED display, so you can set the direction and speed with ease, as well as keep an eye on the battery power levels. This snow blower is also self-propelled, so once you’ve set speed and direction, it does the rest of the work! 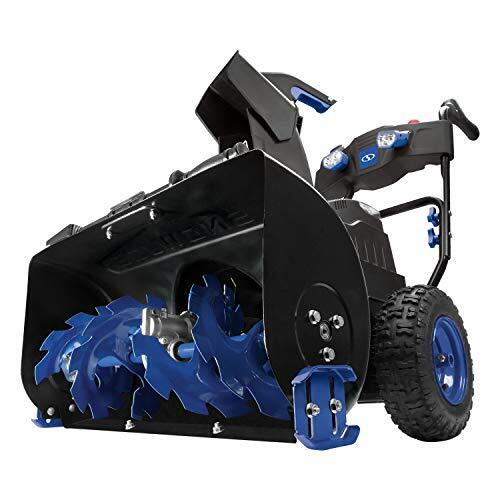 It has a two-stage serrated steel auger and impeller, rather than just scooping the snow and tossing it all in one action, the disrupted snow is lifted and actively blown out of the snow blower, which lets you deal with a lot more snow. This snow blower cuts a path 24 inches wide in the snow that’s up to 12 inches deep with a single pass. If you’re looking for something to begin to rival the power of traditional gas-powered or corded snow blowers, but you’re set against actually dealing with cords, this is the closest you’re going to get. This snow blower boasts the performance of gas with none of the noise, fuss, or fumes. Using Peak Power technology, it utilizes two EGO 56-volt Arc Lithium batteries to handle even heavy, wet snow. It features a high-efficiency brushless motor to keep it running quietly and effectively. With a 21 inch intake and an adjustable variable-speed auger, you can easily control how far the snow is thrown (up to 35 feet) with 180 degrees to determine where the snow is going. It also features two bright LED lights so you can clear snow in the early morning or evening without trouble. The robust steel chassis is built to stand up to aggressive use in the heaviest of conditions. This snow blower kit includes two 7.5 Ah lithium-ion batteries and a rapid charger that can give you a full charge in just one hour, so you won’t have to wait for too long to get back out there and keep your outdoor spaces clear. 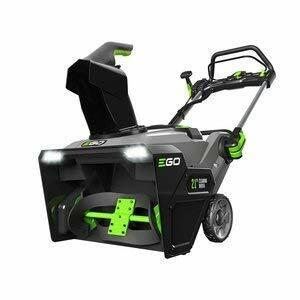 Plus, the EGO Power+ Snow Blower has a quick-fold handle so you can store it out of the way. Additionally, this snow blower comes with a five-year limited warranty, so you’re protected against manufacturer defects! This is one of the most highly-rated cordless snow blowers on the market and you really can’t go wrong with it. It’s the closest match to the performance of a corded or gasoline-powered snow blower that you’ll find in a single-stage cordless blower. One thing you’ll notice a lot as you’re looking at the different snow removal tools on the market is that there are snow blowers and snow throwers, and the difference between the two isn’t intuitive or obvious. The terms are often used interchangeably. Here’s a more detailed breakdown of the differences between the two if you want to learn more! Single-stage blowers have an auger that they use to break up the snow and throw it to the side in one motion. They typically can only handle up to eight inches of snow, though. Single-stage blowers should only be used on paved surfaces because the auger makes contact with the surface being cleared and can’t tell the difference between snow and things like gravel. If you need more information, check this link out. Two-stage snow blowers have a fan in addition to the auger, so once the snow is broken up and lifted, the fan blows it out of the way, allowing you to clear a larger area more quickly. They’re heavier but more capable of navigating sloped terrain and, since the auger doesn’t make contact with the ground, you can use them on unpaved surfaces as well. There’s more information about the differences between the two types, here. Electric snow blowers are a great and eco-friendly option for keeping your outdoor spaces clear of snow. If you’re dealing with light to moderate snow, they work great. They’re typically more lightweight than gas-powered snow blowers and require significantly less maintenance and upkeep than gas-powered alternatives. These are corded, so you’ll need to have ready access to an outlet to keep it running. Gas-powered snow blowers are much more heavy duty than electrical snow blowers and tend to be a little more powerful than the average person needs for their home. They’re bigger and heavier, which can make them difficult to maneuver, but if you have a lot of snow and need a large space cleared, they’re an effective choice. They’re definitely the most powerful option and can handle larger drifts than an electric snow blower can. You’ll need to make sure to have a supply of gasoline on hand. A downside to gasoline-powered snow blowers is that they typically require a lot of maintenance to keep them running smoothly and can be very finicky if you try to use old gasoline or if anything foreign gets into the fuel tank. They can also be difficult to start. Cordless snow blowers are the most lightweight and maneuverable option. You don’t have to worry about running over cords either, though you’ll need to recharge the batteries in between uses. Depending on your needs, you can get cordless snow blowers that are good for all different snow levels. It’s important to note that even the strongest of the cordless options is still less powerful than a gasoline-powered alternative. These are great if you live in a place without a ton of snow, and also if you don’t get really heavy wet snow, which can get caught in your cordless snow blower and cause problems. What Kind of Snow Do You Have? We’ve mentioned this a bit above because it’s a really important thing to consider when choosing the best snow blower for you. 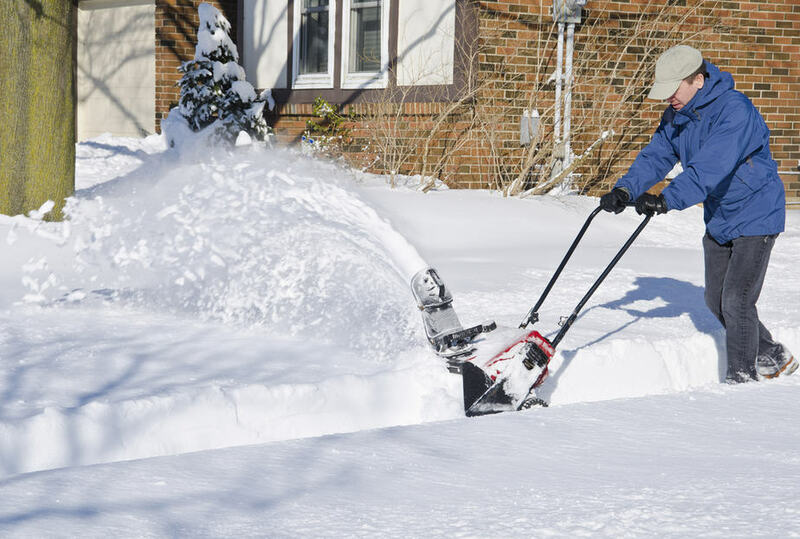 Certain snow blowers are less effective in different kinds of snow. A cordless snow blower is great for most kinds of powdered snow but struggles to handle heavy, wet snow. Cordless snow blowers can get through a light crust of ice on the surface, but may not be able to handle thicker ice. If you’re from an area where each snowfall is slushy and wet, or it’s constantly freezing so there’s a thick layer of ice that gets thicker every day, you may want to consider getting a more heavy-duty snow blower that’s not cordless. When you’re picking out your cordless snow blower, you’ll need to think about what kind of conditions you’ll be dealing with. If you only get relatively light snow, then you’ll be fine with one of the smaller cordless blowers. If you’re dealing with heavier snows, you’ll need one of the beefier options, like the EGO Power+ Snow Blower or Snow Joe ION8024-XRP Cordless Two-Stage Snow Blower. They burn through batteries quicker and their batteries take longer to charge. The best thing about cordless snow blowers compared to their gas-powered alternatives is that they typically top out at around 40 pounds. This makes them much more portable, maneuverable, and easy to store. Cordless snow blowers require a lot less maintenance than other types, but there are still steps to be taken to ensure that your snow blower lasts as long as possible. Whenever you’ve finished with your snow blower, make sure to dry it off before putting it away to prevent any of the components from taking water damage or rusting. Do not keep the charger plugged in between uses and don’t store the batteries attached to the charger. Give the batteries a quick charge at least once every six months to keep them healthy. Store your batteries in a cool, dry area where they won’t be able to freeze, or the battery could be destroyed. Never fully drain your batteries. Take them out when they’re around 80% depleted or you risk shortening their life. There are some more tips, here! 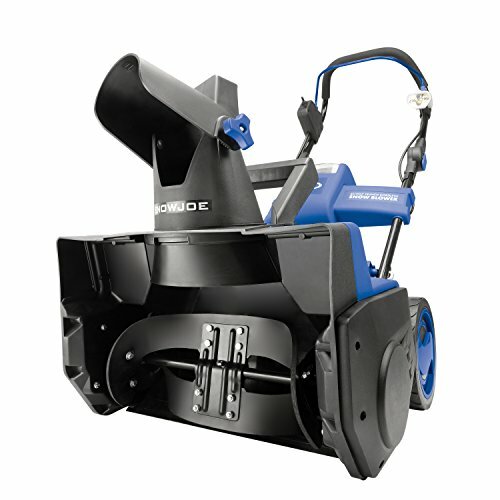 Snow Joe was the first company to begin producing cordless snow blowers. Since their inception in 2004, they have a record of creating innovative outdoor products at a reasonable price. Greenworks is a leader in the production of eco-friendly, battery-powered tools for the outdoors. Their goal is to provide viable alternatives to gas-powered tools. EGO is another major figure in the cordless tools arena. They’re one of the top producers of eco-friendly, gas-free cordless tools worldwide. Q: Do cordless snow blowers work well? A: Yes! They certainly aren’t as powerful as their gasoline-powered counterparts, but unless you have a huge space to clear and a ton of snow, it’s rarely an issue. To clear spaces like driveways and patios, they work just fine and they’re quieter and more environmentally-friendly. Q: Will snow blowers work on gravel? A: It depends on which type of snow blower you have. Single-stage snow blowers will pick up the gravel and send it hurtling along with the snow, which can be very dangerous. They shouldn’t be used on gravel ever, because the auger makes contact directly with the ground. Two-stage snow blowers, on the other hand, can be used on any surface because you control the auger height. As long as you don’t have it set to deal with packed snow (and thus dig into the ground), then you can use it on gravel without fear of creating dangerous projectiles. Q: Can a snow blower fit in a car? A: This will depend on the snow blower you have and also what kind of car you’ve got. You’ll have a harder time with a Prius than with a minivan. That said, a lot of the cordless snow blowers are foldable, like the EGO Power+ Snow Blower, so that they’re more portable and you probably won’t have any trouble fitting it into your trunk. Cordless snow blowers make an awesome and eco-friendly alternative to gasoline-powered snow blowers: they’re lighter weight, more maneuverable, and much quieter. They also require less maintenance, which makes them great! As long as you’re not dealing with a blizzard or super heavy snows (in which case you might benefit from a gasoline-powered snow blower) they should work just fine. 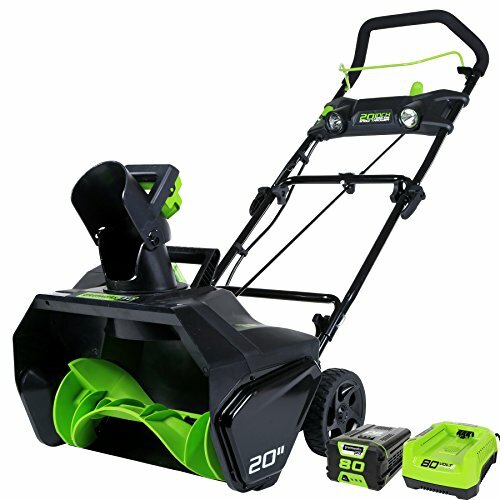 For the casual snow clearer, the EGO Power+ Snow Blower may be the way to go. It’s well reviewed and highly effective in dealing with snow up to 10-inches deep. It may not be on the cheap end of the spectrum, but you really are getting what you pay for here in terms of durability and efficiency. If you’re looking to save, the Snow Joe iON18SB Ion Cordless Single Stage Brushless Snow Blower is available at a much lower price and, if you’re only dealing with a few big snowfalls a year, is a great option. It’s not as beefy as the EGO, but it’s a great option for its price range! We hope you enjoyed our article covering the best cordless snow blowers!